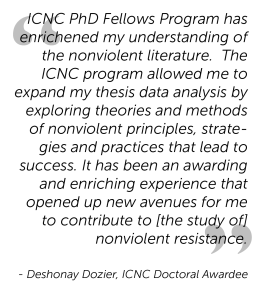 ICNC’s Doctoral, Post-Doctoral and Junior Faculty Research Fellowship enables selected researchers to carry out research on civil resistance and/or conduct a study that can benefit from a civil resistance perspective. The fellowship is expected to lead to a peer-review publication in the form of a journal article, book or a book chapter. 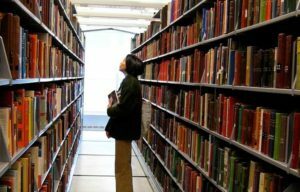 In some cases, and by mutual agreement, the research could be published as part of the ICNC Special Report or Monograph series. Each fellowship award will be between $2,000 to $8,000. In addition to the stipend, the fellowship includes several hours of scholarly mentorship provided by one of the ICNC’s Academic Council members. Mentorship is set up when ICNC matches an awardee with an academic advisor interested in the awardee’s research topic. The deadline to apply is June 17, 2018, but earlier applications are encouraged. To create the best application you can, we urge you to read the rest of this webpage before you apply. Archival work to recover information about civil resistance or case histories of civil resistance. Doctoral students at an accredited university inside or outside his/her home country. 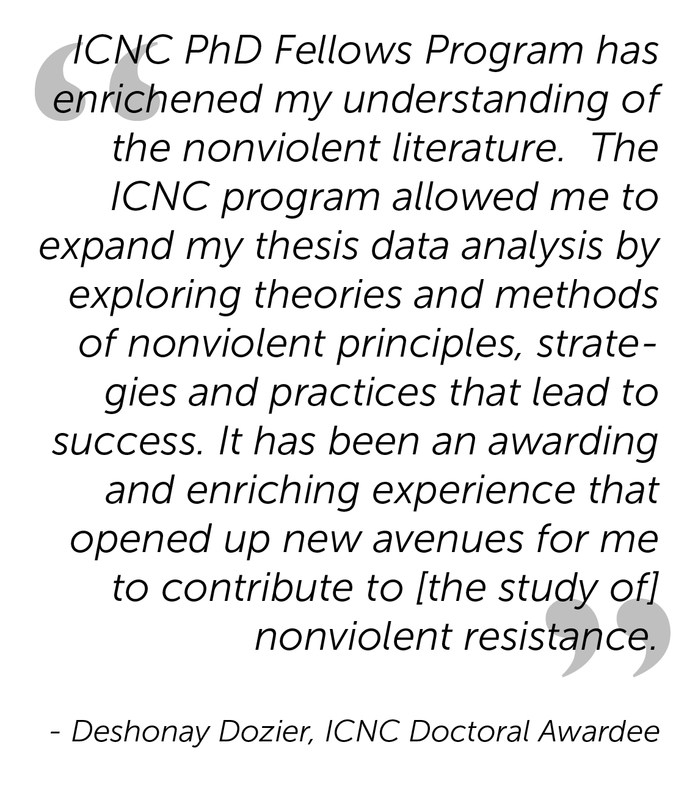 Has a Ph.D thesis that can be enriched by integrating a new or more in-depth analysis of one of the priority research topics in civil resistance or one of the additional themes of interest to ICNC listed above. Plans to start, has started or is continuing work on a peer-review publication that could be enriched or benefit from an in-depth theoretical or empirical civil resistance perspective—and integrating a new or more in-depth analysis of one of the priority research topics in civil resistance or one of the additional themes of interest to ICNC listed above. 5. Budget justification with a detailed budget proposal for research that contains expected costs and an explanation of how the requested funds will be used to support or conduct the research. The ICNC fellowship does not support tuition expenses. The ICNC fellowships range between $2,000 to $8,000. Fellowship stipends are not a substitute for a salary. ICNC provides the fellowship stipend in order to support the fellows in conducting their research. 7. A writing sample of no more than 1,000 words. Our preference is for a sample that has not been published and it should not include the literature review submitted for this application. 4. Budget justification with a detailed budget proposal for research that contains expected costs and an explanation of how the requested funds will be used to support or conduct the research. The ICNC fellowship does not support tuition expenses. The ICNC fellowships range between $2,000 to $8,000. Fellowship stipends are not a substitute for a salary. ICNC provides the fellowship stipend in order to support the fellow in conducting their research. 6. A writing sample of no more than 1,000 words. ICNC’s preference is for a sample that has not been published and it should not include a literature review submitted for this application. The deadline for application submissions is June 17, 2018. Produce, by the end of the fellowship, at least one finished draft of piece that will be submitted as part of a peer-reviewed publication or outlet by the end of the fellowship, which could be a journal article, book manuscript, book chapter, or ICNC Special Report or Monograph relevant to civil resistance. The fellowship stipend will be disbursed in installments. The installments will be made based on an agreed-upon schedule for the submission of relevant assessments and drafts, leading up to the completion of a written draft for a peer review publication. Q: Can you please specify how official the department letter indicating current year of Ph.D. studies and the expected date (month/year) of the thesis completion and submission must be and what form it may take? Must it be authored by the chair of my department or may it instead come from my thesis advisor? May it be submitted as a certified email from one of these two individuals or is a scanned copy of a signed letter required?